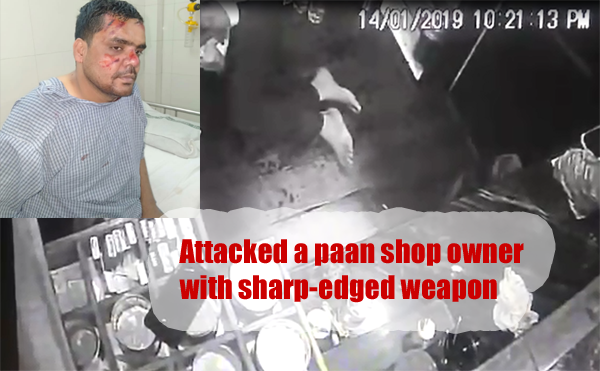 Nagpur: A Son of former police officer attacked a paan shop owner with sharp-edged weapon in Ramdaspeth on Monday night. Police Inspector Hemant kumar Kharabe of Sitabuldi Police Station informed that accused Karan Rajput arrived at the paan shop on a scooterette at around 11 pm. Suddenly he whisked out a sharp-edged weapon and stabbed the shop owner,Santosh Kumar on his face and fled the spot. Injured Santosh was rushed to a hospital. Staff from Sitabuldi Police Station rushed to the spot and launched a man hunt for Karan who is after 24 hours of attack is yet to be arrested. Karan’s father had retired as DySP. According to Cops the attack was a fall out of an old rivalry between Santosh and Karan but according to Nagpur Today sources this goons used to ask for free cigarettes and on refusal led to this attack. Few day back Karan was also involved in similar incident but at the time matter was settled by Police for some unknown reasons.